Blytheville High School senior, Madison Groves, has been awarded the ACT 2! LaGene Hampton Scholarship for 2017. The scholarship presentation was made by LaGene Hampton and the ACT 2! executive board on June 1 at the Ritz Civic Center in Blytheville. ACT 2!. It is offered annually to high school seniors and first year ANC students from the Mississippi County area who demonstrate an interest in theater and will be attending college. 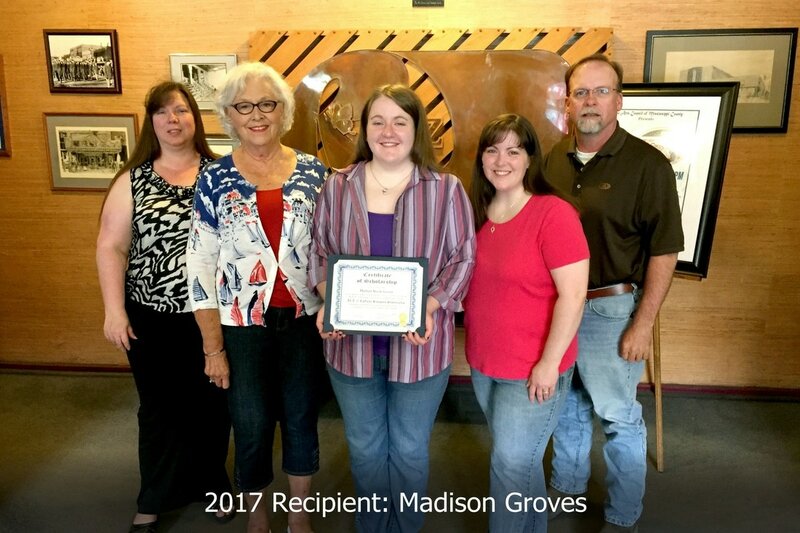 Groves is one of only five students who has fulfilled all of the requirements and received this scholarship in the past ten years. Among the requirements, applicants must volunteer a minimum of 50 hours to the theatre, which may be achieved through such activities as acting in a production, helping backstage, or helping with lights and sound. A minimum of thirty-five hours must be contributed to ACT 2!, and fifteen must be contributed to The Arts Council of Mississippi County. Groves completed nearly twice the number of required hours in only seven months. Groves first began acting with ACT 2! in 2005 at the age of 6 when Hampton encouraged her to audition for a role in one of the children’s productions. She landed the role, and since then, she has been an actor in eighteen ACT 2! productions and a part of the crew in a dozen other shows. Although Mrs. Hampton no longer lives in Blytheville, she was honored that she had the opportunity to be on hand for the scholarship presentation. “I am so proud of Madison and all of her accomplishments in school and with ACT 2!” stated Hampton. Groves is the daughter of Greg and Candie Groves of Blytheville. She has been accepted into the Honors College at Arkansas State University and will begin classes in the fall where she intends to double-major in biology and chemistry (pre-dental), as well as pursue a minor in choral music. ACT 2! Community Theatre group is an affiliate of The Arts Council of Mississippi County. For more information about ACT 2! Community Theatre or the ACT 2! LaGene Hampton Scholarship, call 870-762-1744, or stop by the Ritz Civic Center, Monday-Friday, 9am-5pm.